The thief ant, which is also called the grease ant, is a very common ant in homes—especially in kitchens—across much of the U.S. It is so tiny—as small as 1/32 inch long—that it can easily slip into homes through cracks and make its nests in tiny crevices both within the home and outside. This ant is often confused with the pharaoh ant, which is actually slightly larger in size. is 1/32 to 1/16 inch. has very small eyes in relation to the size of the head. is yellow, bronze, light or dark brown. has a body that is very smooth and shiny. thief ant because it habitually nests near—or even inside —the nests of other ants, and then steals their food and their brood or larvae. grease ant because it prefers to feed on grease and high-protein foods (such as meats, cheeses, seeds, or dead insects). solenopsis molesta because this is its scientific name. 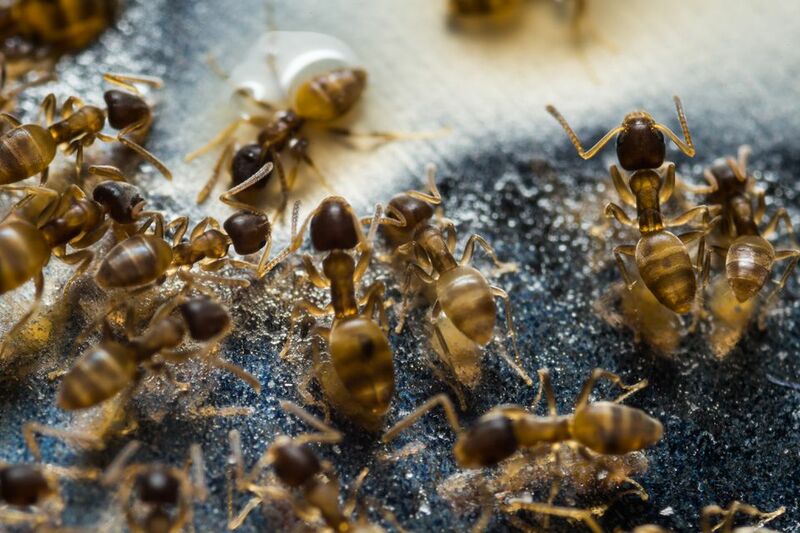 Thief ants are more likely to have an indoor nest than are pharaoh ants. Thief ants have 2 clubbed antennae, pharaoh ants have 3 clubs on their antennae. Both thief ants and pharaoh ants are omnivorous—eating just about anything, but thief ants prefer grease and high protein foods, while pharaoh ants prefer to feed on sweets. Thief ants are yellowish to brownish in color, whereas the pharaoh ant is more reddish with black markings on its abdomen. Grease ant colonies are generally small in size, perhaps because of their thieving nature. However, a single colony can have a number of queens. This ant most commonly enters homes in mid to late summer. The nest will often be large and connected by tunnels to the nearby nests of other ants—providing access by which they are able to steal their food. Outdoor nests may be under rocks, around foundations, in bare soil or decaying wood. Indoors, they may nest anywhere there is a small crack, especially behind baseboards, in wall voids, beneath floors, in cupboards etc. The ants will travel far distances for food, then will set trails to that food. Indoors, these trails may flow along baseboards and in cabinets; outdoors, the thief ants often trail along the branches of trees or shrubs or even along electrical wires. Because this ant is so small, it can easily get into food packages to eat and contaminate the food. The first step in controlling any ant species in and around your home is knowing what type of ant it is. This is important because baits are often the best option for control, but different ants have different food preferences—and baits are not effective for outdoor-nesting thief ants. Even within this species, control recommendations vary depending on whether the thief/grease ant colony is within the home or outdoors. Mix a chemical ant bait, such as Terro or Drax Ant Bait, with grease or oil, such as vegetable oil and peanut butter. This mixing will require a bit of trial and error as exact proportions have not been documented, but you will need to add enough grease to the bait so it is attractive to the ants, but not so much that it will dilute the active ingredient below the level of effectiveness. Add a single drop of grease or oil to 5 to 10 drops of bait on a piece of wax paper. Place the baited wax paper in the area in which ants have been seen. If the ants are not attracted to the bait, add another drop or two of grease, or try another oil. Other options can be used instead of wax paper, such as the back side of masking tape, small squares of cardboard or paper, or directly on the floor or surface where the ants are trailing. Always keep baits out of reach of children and pets, and follow directions on the pesticide label. This is one for which the standard ant recommendation of baits is not effective if the ants are nesting outdoors. Rather, the best option is to locate the nest and treat it directly. To locate a nest, follow the trail of ants backward from the food source. However, because these ants are so small and will nest in areas that are distant or hard to reach, it can be difficult, or even impractical, to locate outdoor nests. So, if the outdoor nest cannot be found, a perimeter treatment of the home can help to keep outdoor-nesting ants from coming indoors to forage for food—or set up new nests. It is, however, important to ensure that the invading ant is a thief/grease ant, and not a pharaoh ant, as treatment varies greatly for these two ant species. In addition to treating for ants, there are a number of methods for helping to prevent ants from entering the home to forage for food or seek shelter. Seal pests out: Although these ants can enter through the tiniest of cracks, it is important to caulk or otherwise seal all potential entry points that can be found. Put away foods: Do not leave open foods out on counters—cover them in pest-proof containers or put in the refrigerator; do not leave pet foods out overnight, or even during the day once mealtime is over; wash dishes immediately after eating—do not let dirty dishes sit in the sink. Keep it clean: Clean up food spills immediately; keep all floors swept and mopped, and counters wiped of crumbs and grease; empty garbage regularly and keep the can and area clean; reduce and eliminate clutter.